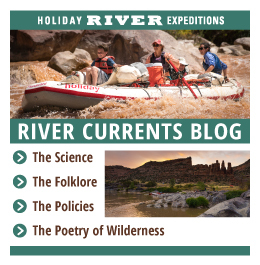 Holiday River Expedition is a veteran river rafting and biking outdoor adventure service, offering excursions in Baja, Colorado, Idaho and Utah. The Colorado River rafting trips offer a variety of canyon tours, and the river itself is one of the best white water rafting rivers in the United States. While floating down the river, guests will see several historical sites and nature’s grand display of several canyons’ geologies. Utah river rafting offers several different tours, including Yampa River, Westwater Canyon – often considered a small version of the Grand Canyon, San Juan River, Lodore Canyon, Desolation Canyon and Cataract Canyon. Idaho river rafting features the famous Salmon River, though it is divided into two tours. The rugged features of this raw wilderness encompass more than 20,000 square miles. The feast of a lifetime awaits guests on these adventure-filled tours. Maintaining the idea of an all-inclusive vacation, the staff creates fresh, delicious menus that address nearly every special dietary need. With advance notice, vegetarians, those with food allergies or guests with special requirements, receive special accommodations. Breakfast includes omelets, blueberry pancakes, cereal, fresh fruit, yogurt and sausage. Snacks are included throughout the day, including a variety of trail mixes. A deli-style lunch is served alongside the river and dinner consists of famous Dutch-oven meals, fresh salads, salmon or steak. Guests will not be hungry or miss a meal. Focusing on maintaining equipment and keeping it in excellent shape, Holiday River Expedition believes in professionalism, which translates to clean gear and putting guests’ safety first. The fleet of equipment includes oared rafts, which accommodate up to six guests, including camping gear and food. Paddle rafts help give guests a physically intense experience, taking an active role in guiding the raft over the rapids. The inflatable kayaks are for one person, allowing individuals to explore on their own or with small groups. 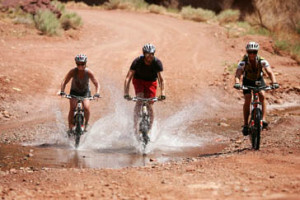 Mountain bikes receive regular maintenance, making the off-road adventure a high-spirited experience. Camping gear is available for rent or guests can bring their own. Paco pads, one-and-a-half inch thick foam and air filled mats, help make sleeping outdoors a more enjoyable experience. Weatherproof tents, sleeping bags and dry river bags are available too. A fleet of vans drops guests off at their starting point and greets them at their final destination. Holiday River is a one-stop, family river rafting destination where excitement and adventure awaits guests for the experience of a lifetime.